So I once said when I laid down the scythe, looking at the heap of green. Then I realized that most of the plants in the garden are edible! Most are bitter and intense, very much to my liking! In preparation for this hunter-gatherer’s season I am going to create this cheat sheet – not to pick anything toxic. Field Fennel Flower. One of my former decoration-only plants. The seeds of the cultivated variety are used to spice pita bread – but these wild seeds should be used sparingly because they contain a toxic alkaloid. 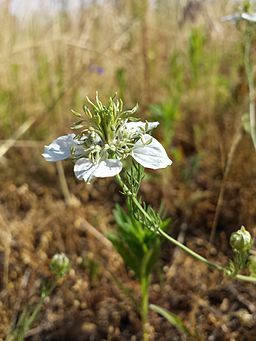 Nigella arvensis, Field Fennel Flower, once a decorative plant in Victorian gardens. Image by Stefan.lefnaer, Wikimedia. 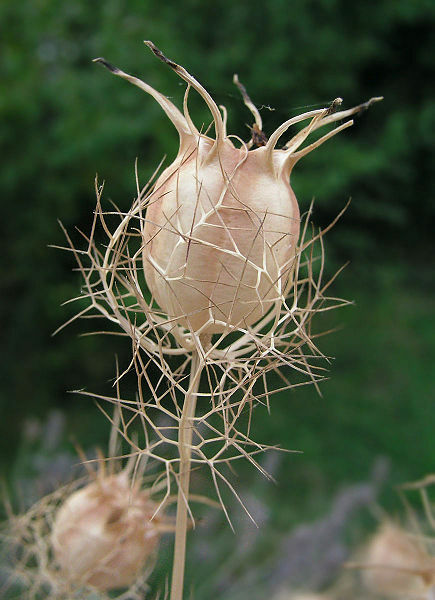 Nigella arvensis fruit,. Image by Luis Fernández, Wikimedia. Daisy Fleabane – my favorite daisies on sticks, to be used for tea and salad. It had been imported to Europe from America in the 17th century as an ornamental plant. Erigeron annuus, Daisy Fleabane. The German name translates to Magic Spell Herb. Image by AnRo0002, Wikimedia. Normal (short) Daisies: the 2nd most common plant in the ‘lawn’ after yarrow. I find they taste similar to spinach. Bellis Perennis, Daisies. Historical view of our garden without the solar collector, but with tall trees. Daisies liked the forest-like climate even better. Or maybe I am romanticizing the past – still lots of daisies today. 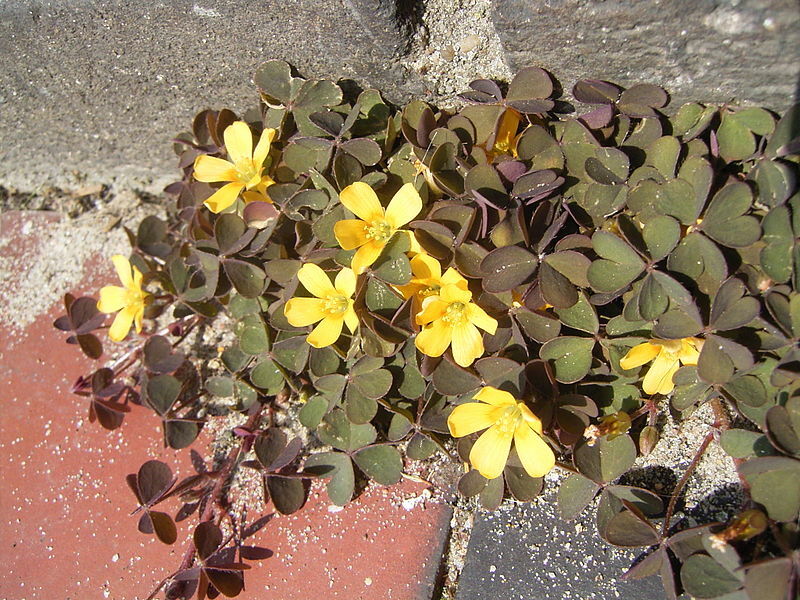 Oxalis corniculata, Creeping Woodsorrel. One German name translates to Red Jumping Clover – referring to its catapulted seeds. Image by TeunSpaans on Wikimedia. 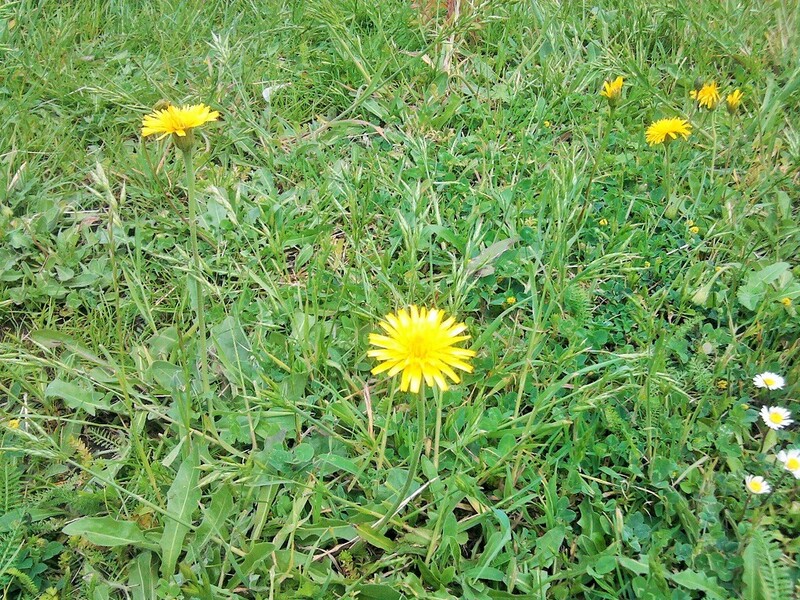 Dandelions – I usually uprooted them. The leaves taste like rocket salad with a touch of nuts, and the buds can be used like capers. After World War II people had used the roasted roots as a replacement for coffee. Taraxacum, Dandelion. The German name means Lion’s Tooth – just as the English one, as I learned from Pairodox’ post. (Image stumbled upon when browsing our our photo folders). I uprooted this one, too: Chickweed, showing up in early spring. It tastes a bit like fresh corn kernels. Stellaria media, Chickweed. One German common name translates to Chicken’s Colon. Not sure if this is related to chickens’ craze for it or to the white rubber-like, elastic strand inside the stem. Image by Sanja565658, Wikimedia. Purslane. Another Plant I had promoted it from weed to decoration. It should taste like pepper, and can be eaten fresh or cooked. Its Wikipedia page features the nutritional merits extensively. In contrast to pepper it survives in our colonies of slugs. Generally, wild edible plants go well with our No Pest Killers / No Fertilizer policy. 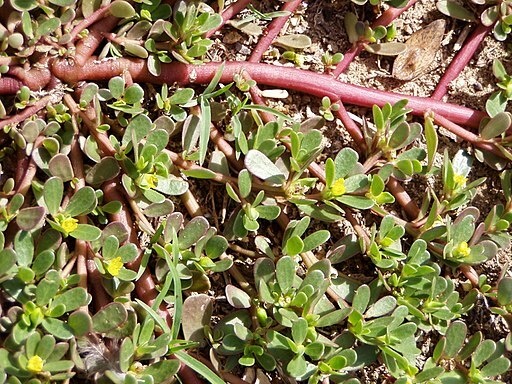 Portulaca oleracea, Purslane. The wild variety is creeping as this image shows. We will also try to grow another kind that grows upright. White Stonecrop. Also resembling green pepper, but more sourly. Sedum Album, White Stonecrop with reddish leaves, growing near the supporting construction of our solar collector. (The smaller, greener one is toxic Sedum Acre – Yellow Stonecrop). White Yarrow – the perfectly scythe-able, drought-resistant replacement for grass. Great for tea, and perhaps salad in small quantities. Achillea millefolium, Yarrow. It grows (even) more extensively after the trees had been removed. Image by AnRo0002, Wikimedia. Fireweed – the plant flooding our office with cotton-like fluffs every year as I let a few of them grow, for their ornamental merits. Dave from Pairodox Farm had once published a stunning image of similar seeds of Milkweed. You could use leaves and stems, and the young sprouts are said to taste like asparagus. My expectations are high! Violets. Young leaves are edible and the fragrant sweet blooms seem to be somewhat famous. I think I will not eat them though! Viola, Violets – in our ‘lawn’ of yarrow, daisies and yellow stonecrop. I add two classical plants in the herb garden because I had just found them as alleged wild flowers in our garden: Oregano. I recognized it as an edible herb when spotting a blooms on a salad served in a restaurant. Until writing this post and comparing close-ups of blooms I was sure it was marjoram. 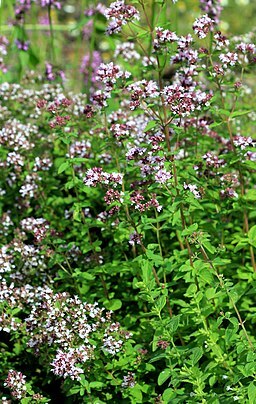 Oregano, Origanum vulgare. Surviving in our winter and in summer without extra watering. Image by Karelj, Wikimedia. Lemon Balm. Great for tea, but I like the green leaves especially as a replacement of jam in pancakes Austrian style. I don’t like sweet taste too much – perhaps that’s why I enjoy all these bitter herbs!. 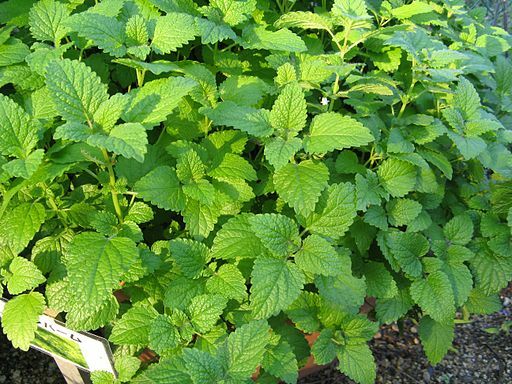 Melissa officinalis, Lemon Balm – hard to get rid of it if you don’t want it. Image by KENPEI, Wikimedia. Dandelion, daisies, white stonecrop, and chickweed. Meadow Goat’s Beard. The leaves can be used like spinache – cooked with olive oil and garlic, very tasty – but German articles suggest the roots are the real delicacy, similar to Black Salsify. Tragopogon pratensis, Meadow Goat’s Beard. Blossoms and also leaves are somewhat similar to dandelions, but leaves are thicker, and they come in different textures and colors – a bit ‘hairy’ versus smooth.